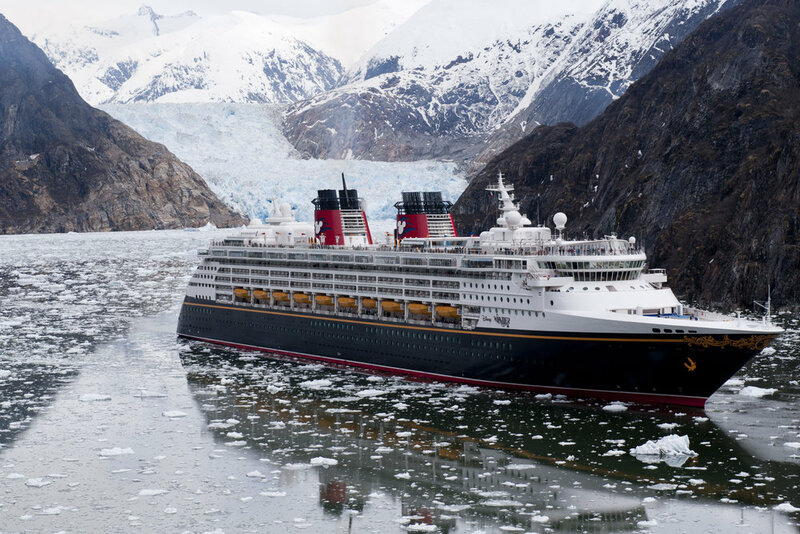 My family recently sailed on two cruises back-to-back on the Disney Wonder: first, a 5-night Pacific Coast cruise from San Diego to Vancouver, followed by a 7-night Alaska sailing round-trip from Vancouver. Alaska and the Pacific Northwest offers some of the most breathtaking scenery in North America, and I was eager to introduce my three daughters to all of its splendor. The perfect itinerary for nature buffs and adventure seekers, your days will not be spent lounging by the pool with a fruity drink. Instead, they’ll be filled with jaw-dropping scenery, wildlife sightings, and learning all about the grandeur and beauty that Mother Nature can offer. There are four different stateroom types on the Disney Wonder: interior, ocean view, verandah, and suites. Interior and ocean view staterooms hold either three or four people, depending on category and location, while verandah staterooms sleep from three to five people and suites sleep from five to seven people. Being a family of five, we opted for two staterooms this time instead of one room. There are many pairs of connecting staterooms on the Wonder, which is perfect for larger families. We enjoyed the extra bathroom, television, and storage space that two staterooms provide. While we had a verandah, we preferred to be up on Decks 9 and 10, enjoying the scenery and only used the verandah a few times. Suites are considered concierge level and will give you access to a wide array of perks, such as access to the concierge lounge, concierge hosts to assist you with anything that you may need, and a private reception and lunch on boarding day, among other things… all at a price. KidTripster Tip: If anyone in your party is prone to seasickness, choose a room near the center and bottom of the ship. This area experiences the least amount of movement in rough seas. 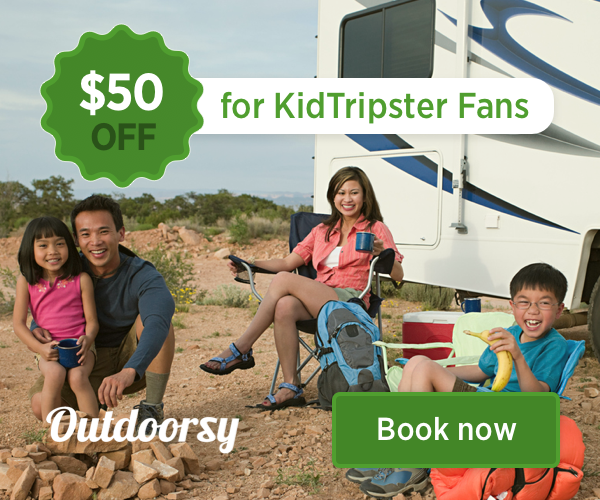 KidTripster Tip: Some of the more popular room types can sell out quickly, so book early for the best selection, especially if you want connecting rooms. There are countless food options all day long on board the Disney Wonder. For breakfast, the option with the widest selection is Cabanas, the restaurant on Deck 9. There, you’ll find an enormous buffet with every breakfast item that you can imagine, even made-to-order eggs and omelets. Triton’s, one of the main dining rooms for dinner, is also open for breakfast, but it’s table service with a smaller menu and more limited hours. Room service also is available but limited to cold items unless you are in a concierge-level room, where you can order hot items, as well. You can call that morning or place the provided card on your door the night before. Lunch options include a buffet at Cabanas, a more limited table-service menu at Triton’s or a variety of quick-service counters located on Deck 9 by the pools: Daisy’s DeLites (salads, wraps, and sandwiches), Pete’s Boiler Bites (hot dogs, hamburgers, chicken tenders, and french fries), and Pinocchio’s Pizzeria. KidTripster Tip: Your kids will quickly discover Eye Scream, the soft-serve ice cream station on Deck 9. The flavors change daily. Dinner each night is served in the three main dining rooms: Triton’s, Tiana’s Place, and Animator’s Palate. When you book your cruise, you’ll choose either early dining (5:45 p.m.) or late dining (8:15 p.m.). You’ll be assigned a dining rotation (written on your room key) and rotate through all of the restaurants throughout your cruise. 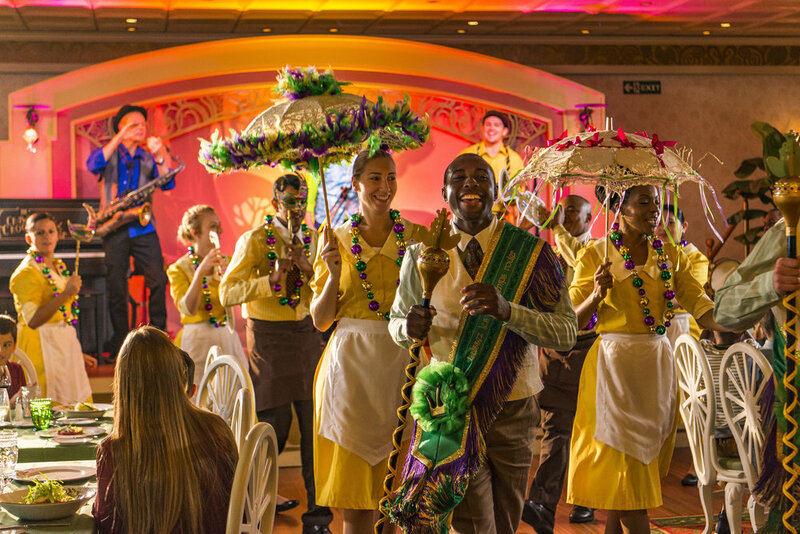 Your serving team follows you to each restaurant, so that you have the same wait staff for the entire cruise. They’ll get to know your family, your likes and dislikes, and any food allergies. You have an assigned table reserved just for you every night, so no need to arrive early or wait in line. Our girls have always enjoyed dinner in the main dining rooms, and many (but not all) of the meals have a fun addition such as a character appearances, live music, animation shows, or parades. Your servers will encourage you to participate, so do! If you’re not feeling up to the main dining room (although I encourage it - Disney knows how to make dining fun! ), you have three other options for dinner. Cabanas changes to a table-service restaurant at dinner. There are no assigned dining times, so you can arrive anytime during the posted dinner hours. Know that it’s not open for dinner on the first or last nights of the cruise. The other options are the quick-service counters around the pools on Deck 9 or room service, which is available 24 hours a day. KidTripster Tip: Dinner in the main dining rooms can take up to two hours, as they’re several courses long. That can sometimes be a challenge with young children, especially if they’re tired after a long day. Consider reserving time in the nursery for children (under 3) during part or all of your dining time or taking older children to the Oceaneer’s Club after they finish their meal. Your servers will expedite their meals, if you ask. Palo is the adult-only dining venue on the Disney Wonder. Guests (ages 18 and over) can dine here for dinner any night of the cruise or at brunch on sea days. The restaurant is located on the top deck of the ship at the very back with 180 degree views of the ocean. While both are lovely, brunch is my favorite, and I never miss it. Upcharge cost: $30/person plus gratuity; reservations required. KidTripster Tip: Curious about tipping on a Disney cruise? Read here. Sea days can be as busy or as restful as you want them to be. Each evening of your cruise, you’ll receive a Personal Navigator in your stateroom during turndown service which includes a schedule of all the activities for the following day. Be sure to review the schedule carefully for things like character appearances, trivia, family crafts, animation classes, deck parties, movies, karaoke, dance parties, and more. There are scheduled activities all day long - some just for kids, some just for adults, and some for the whole family. Kids have dedicated spaces on the ship just for them, divided by age group. Children (under 3) have It’s a Small World Nursery, which requires advance reservations and a small fee ($8/hour) due to the low child-to-caregiver ratio. The Oceaneer Club and Lab are for children (ages 3-12) and are home to both structured activities like games, cooking classes, and slime making, as well as unstructured play areas like the Andy’s Room playscape. These spaces are usually secured, meaning children cannot leave without being checked out by an authorized adult (unless self checkout privileges are given by parents), but there are short periods each day that are considered an “open house” where people of all ages are free to come and go. Older kids have their own spaces too: Edge (ages 11-14) and Vibe (ages 14-17). KidTripster Tip: Kids must be fully potty-trained to visit the Oceaneer Club and Lab during programming hours. While the kids are enjoying the youth spaces, adults have their own spaces for indulging. The Quiet Cove Pool, Cove Cafe, Cadillac Lounge, and Senses Spa and Fitness Center are all reserved for guests (18 and over) at all times. In the evenings, the Azure Lounge and Crown & Fin Pub also are reserved for those 18 and over after 9:00 p.m.
For some fun in the sun, the kids have three different options: Goofy’s Pool, the AquaLab (which includes the Twist ’N’ Spout water slide), and Dory’s Reef, a shady splash pad area. Children in swim diapers are not allowed in the pools, so Dory’s Reef would be their only option. Goofy’s Pool is adjacent to Funnel Vision, a large outdoor movie screen that shows Disney movies throughout the day. The pools are heated and open for all sailings, even Alaska! Because we sailed early in the season (late May), the temperatures were too cold for my girls, though we saw others swimming even on the chillest days. KidTripster Tip: Complimentary life vests are located on the pool deck and available for children to use in the pools on board. During the evenings, the shows in the Walt Disney Theater are not to be missed. There are three main stage shows on the Wonder: The Golden Mickeys, Dreams: An Enchanted Classic, and Frozen: A Musical Spectacular. These Broadway-caliber shows are incredible productions and popular with passengers of all ages. On other nights, you’ll see variety acts such as musicians or comedians. The evening shows are shown twice each night: once during early dining and once during late dining. You go to the show opposite of your dining time. The Pacific Coast and Alaska itineraries offer an abundance of things to see and do, so this cruise is definitely one where you should get off the ship and explore! Port adventures can fill up early, so don’t wait until you board the ship to decide what to do. Research and book well in advance for the most options. In the following sections, I’ll discuss my picks for each port. KidTripster Tip: Booking excursions through Disney Cruise Line can be unnecessarily expensive. As a rule, you’ll most likely get a better price and comparable (or even better) experience by booking your family’s excursions independently. I’ve listed some recommended outfitters in the following sections. Just make sure you’re back to the ship on time. Most of these operators are accustom to dealing with cruise passengers, so it shouldn’t be a problem. I have always wanted to visit Alcatraz, so this one was an easy decision for my family’s first visit to San Francisco, especially considering that we only had a few hours on shore. To visit the island prison, you must purchase tickets through Alcatraz Cruises, the only commercial boat service authorized by the National Park Service to carry passengers back and forth to Alcatraz Island. There are several tour options, but we chose the Day Tour which includes ferry transportation to and from the island, unlimited time on the island, as well as the audio tour of the cell house. Online tickets go on sale 90 days prior to your departure date and often sell out quickly, so buy them as soon as you can. Cost: Youth (4 & under) Free; Youth (5-11) $23; Adult $38. Alcatraz Cruises is located at Pier 33. It took us about five minutes to walk there from Pier 27 where the Disney Wonder docks. It’s recommended that you arrive 30 minutes prior to your assigned time. While you wait, look at the large map of the island to familiarize yourself with the layout prior to arrival. KidTripster Tip: Luggage, coolers, and oversized backpacks are not allowed on Alcatraz Island due to safety concerns. There are no storage facilities at the Pier 33 Alcatraz landing area. The ferry boats are large with both indoor and outdoor seating. The ride to the island is about 15 minutes, and if the weather is good, be sure to step outside for fantastic views of the Bay Bridge, Golden Gate Bridge, and San Francisco skyline. Return ferries run at regular intervals. I’d recommend allowing yourself about 2-1/2 to 3 hours for the entire visit. KidTripster Tip: Food and drinks aren’t available for purchase on the island, but there’s a small snack bar on the ferry and also at the Pier 33 landing area. On the island, water is allowed everywhere, but food can only be consumed at the dock. Once on the island, you can buy a map ($1) and begin exploring. We went straight to the cell house, which sits at the highest point on the island. The quarter-mile walk to the cell house is steep and hilly, so be prepared. There’s a tram system, but it's use is strictly limited to those with mobility issues. KidTripster Tip: Strollers are allowed on the island but be prepared to push them up steep hills to get to the cell house. The award-winning cell house audio tour, Doing Time: The Alcatraz Cell House Tour, was our favorite part of the day and is not to be missed. Even my kids - ages 8, 11, and 13 - enjoyed it and stayed engaged throughout the experience. The audio tour is narrated by former inmates and correctional officers who provide both points of view about daily life in the prison and the numerous escape attempts. If you don’t have a lot of time on the island, make the audio tour your first priority. A pleasant surprise for us was the beautiful gardens all over the island. Grab a Gardens of Alcatraz brochure from the book store near the ferry dock to learn about the history of the gardens and help you identify the flowers that you’ll see. The best time of the year for the gardens is January through September. KidTripster Tip: Comfortable shoes are a must. Also the weather on Alcatraz can change quickly, so dress in layers and bring a light jacket, even on warm days. What to do in Victoria, British Columbia? The Butchart Gardens (800 Benvenuto Ave., Brentwood Bay) are designated as a National Historic Site in Canada and were my family’s first choice for our day in Victoria, British Columbia. Receiving over a million visitors a year, the gardens were created in the early 1900s by the Butchart family (who still own them today) on the site of an old limestone quarry. They’ve been continuously improved and expanded over the last hundred years and now offer 55 acres of immaculate and breathtaking scenery. The gardens are about a 30-minute car ride from the cruise port. There are four options to get there: rent a car, taxi, tour bus, or private transfer. Renting a car or purchasing a tour with bus transportation requires you to first make your way to downtown Victoria from the cruise port and then back again at the end of the day; all tours leave from the Fairmont Empress. This option may be preferred if you wish to also explore downtown Victoria. Otherwise, a taxi or private transfer can pick you up directly at the cruise port. We chose a private transfer through Ascot Limousine Services and added on a driving tour of the city. Our car was a Daimler limousine and allowed us to tour the city in style! Our driver, Gilles, was full of information and knew all of the best places to go. Cost: about $114 per hour plus gratuity; varies depending on the exchange rate. You can purchase garden tickets when you arrive, but instead I recommend getting them in advance online to avoid the long lines. Once you enter, grab a free map from the welcome center begin exploring. The most breathtaking sight that you’ll likely see is the Sunken Gardens, and I suggest heading there first. These gardens were the highlight of our day and unlike anything that I’ve ever seen. It truly felt like you were walking through a fairy tale. Also, be sure to visit the Children’s Pavilion and Rose Carousel with its 30 unique, hand-carved animals. The Rose Gardens were not blooming while we were there but do reach their peak in late June through August. Round out your tour by meandering through the Japanese and Italian Gardens. Cost: Youth (5-12) about $2; Youth (13-17) about $7-$13; Adult about $14-$26, depending on time of year and exchange rate. Although the gardens may seem more suited to adults, my kids actually really enjoyed them. The gardens are large enough for them to be interested and impressed but small enough that they could see all of it before getting tired or bored. KidTripster Tip: The grounds are stroller- and wheelchair-friendly except for a small lookout area in the Sunken Garden. Complimentary wheelchairs and strollers are available (first-come, first-served) for a refundable deposit. However, large crowds can make strollers difficult to manage, so a baby carrier may be a better option. We finished our day with Afternoon Tea at the Dining Room, located in the original Butchart residence. The authentic English tea experience (separate children’s version available) was a set menu and began with an English trifle, followed by a traditional 3-tiered tray of savories, sweets, and scones with cream and jam. Each person was able to choose a tea flavor and received their own pot to keep it hot. Tea in the Dining Room was the highlight of our visit for the adults, but my picky eaters were less impressed. Family travel is all about compromises, and sometimes parents get to do what they want for a change! Reservations are recommended. Cost: about $29/person. Allow about two hours to visit the gardens or 3-1/2 hours if you want to include tea or a meal at one of the restaurants. On your way out, be sure to stop at the Seed and Gift Store which carries on Mrs. Butchart’s tradition of packaging flower seeds and selling them. You can find over 100 different seeds and seed combinations, as well as traditional souvenirs. What to do in Juneau? For our day in Juneau, we chose to go whale watching and visit the Mendenhall Glacier by booking a combo tour through Juneau Whale Watch. The tour begins in downtown Juneau, right where the cruise ships dock. We met our representative and were shown to a small bus for the 25-minute drive to Auke Bay. KidTripster Tip: Watch for bald eagles the entire time that you’re in Juneau. We saw a field with five to ten of them while on the bus ride and more from the boat. When we arrived at Auke Bay, we met our crew and boarded a dual-hulled catamaran which had both heated indoor and outdoor viewing areas and held about 50 people. Be sure to dress in layers and bring waterproof footwear and waterproof jackets (Juneau averages 62 inches of rain per year, and it rains an average of 230 days per year) plus your own binoculars (although the boat will have some that you can borrow). Our mission for the day was to see humpback whales, and we accomplished that mission! We spent about two hours on the water and saw several whales as the captain is constantly monitoring whale sightings via radio and always knows where the action is. While on board, the crew told us about Whale SENSE, a program that promotes responsible whale watching for commercial whale watching companies. This voluntary program has guidelines about how close the boat should get to the whales and how long a boat should stay near a whale before leaving. Juneau Whale Watch has been a participant since 2015. KidTripster Tip: There’s a marine toilet on all of the boats, but I suggest using the public restrooms near the meeting location before you leave. After the whale watching, we reboarded the bus for the short drive to the Mendenhall Glacier Visitor Center (6000 Glacier Spur Rd). Mendenhall Glacier is a 13-mile-long river of ice and the most visible portion of the massive Juneau Icefield. Inside the visitor center, you’ll find a short movie about the glacier, interactive exhibits, telescopes, ranger talks, a bookstore, and sweeping views of the glacier. Kids can pick up a booklet to complete during your visit and then become a member of the Glacier Expedition Club; it’s similar to the national park’s Junior Ranger program. Hike the easy trail to the base of Nugget Falls and the glacier; it takes less than an hour round-trip. KidTripster Tip: The tour operator does pass out granolas bar and bottles of water during the boat ride, but there’s no food for purchase on the boat or at the Mendenhall Glacier Visitor Center. In addition, no food or drink other than water is allowed at Mendenhall Glacier from May through September due to bear activity. Cost for the whale watching plus Mendenhall Glacier: Youth (2 & under) Free; Youth (3-12) $120; Adult $135. Buses leave the visitor center at regular intervals and return back to downtown Juneau. We were hungry when we returned and made two stops on foot for lunch: Alaskan Crepe Escape for the kids and Tracy’s King Crab Shack for the adults. Alaskan Crepe Escape (356 S. Franklin St.) is a walk-up counter which serves a large variety of both sweet and savory crepes. There’s no seating, so enjoy your crepe as you explore the downtown streets on foot. Tracy’s King Crab Shack (432 S. Franklin St.) is a staple for cruisers due to its close proximity to the dock and is home to the largest, freshest king crab legs that you’ll ever find. My favorite was the crab bisque. KidTripster Tip: Indoor seating at Tracy’s can be limited, but the covered outdoor seating area has heaters, so don’t hesitate to sit outside. After lunch, we went up the Mt. Roberts Tramway (490 S. Franklin St.), located right next door. The tramway is the only aerial tramway in southeast Alaska. It lifts you 1800 feet through the rainforest. On the ride up the mountain, you’ll experience magnificent views of Juneau and the Gastineau channel, weather permitting; if it’s foggy, don’t bother spending money on this trip as you won’t be able to see a thing. Once at the top, you’ll find the Timberline Atop Mt. Roberts Restaurant, the Raven Eagle Gifts and Gallery, the Nature Center, and the Chilkat Theater, which shows an 18-minute film about the history and culture of the area. You’ll also find an outdoor viewing platform perched on the side of the mountain. Allow for an hour to 1-1/2 hours to explore everything. Cost: Youth (2 & under) Free; Youth (3-12) $17; Adult $34; tickets can’t be purchased in advance. KidTripster Tip: Be sure to pay a visit to Lady Baltimore, a bald eagle who lives at the nature center. She was shot and left for dead but found by hunters who rescued her and got her to a rehabilitation facility. She can no longer fly due to her injuries and is now well cared for by volunteers. What to do in Skagway? For our stop in Skagway, we rented a jeep through DIY Jeep Tours (corner of 2nd & State Streets) so that we could explore this beautiful area on our own schedule. The check-in location is located just a few blocks from the cruise port; it’s an easy walk that allows you to see a bit of the town. Inside the Jeep, you’ll find a mile-by-mile guidebook and CD which provides you with all sorts of information about the history of the area and the scenery that you’ll encounter. We chose the most popular route up the Klondike Highway to Emerald Lake and back, paralleling the famous White Pass Railway train ride. The drive is about three hours without stops, but we took about seven hours round-trip. Cost: $250/day; reserve in advance. KidTripster Tip: Make sure the drivers have their drivers’ licenses and proof of insurance. All members of your group will need a valid passport that allows entrance to Canada and back into the United States. Skagway sits 15 miles from the Canadian border and all tours leave the United States and re-enter through U.S. Customs. The scenery on the drive up the Klondike Highway is some of the most spectacular that I’ve ever seen. Be sure and have a passenger narrate using the mile-by-mile guide as you journey through this incredible landscape. Also keep your eyes peeled for wildlife like bears, moose, and sheep. We saw a beaver and a bear! The highlight for the kids was a stop at Tutshi Sled Dog Tours (Km 74.5 South Klondike Highway, Carcross). You can choose between a cart tour, an educational talk or gold panning, but we just paid for admission so that we could play with the Alaskan Husky puppies! For the girls, this was hands down the highlight of the entire vacation. Admission cost: Youth (Under 5) Free; Others about $4, depending on exchange rate. KidTripster Tip: Pick up the jeep right at 8:00 a.m. and head straight to Tutshi Sled Dog Tours without stopping if you want to beat the tour buses and have the puppies all to yourselves. You can stop and enjoy the scenery on the return trip. The highlight of the day for the adults was stunning Emerald Lake, which was our northernmost point before returning. Near the lake, be sure and make a stop at Carcross Desert, considered by many to be the smallest desert in the world. Also near this area is the tiny town of Carcross, Yukon Territory (population: 301), a perfect place to stop for lunch. There are only a few restaurants in the area, and we chose The Bistro on Bennett (Carcross Commons) in downtown Carcross. The food was excellent, and the fish and chips were to die for! We made frequent stops on the return trip to admire the scenery. There are many pull-offs for you to stop the jeep and take photos but watch carefully for signs about rock slides as there are several stretches where stopping the car is prohibited. We made a stop at the Yukon Suspension Bridge (97 Wickstrom Rd., Whitehorse), which includes the bridge, walking trails, and an outdoor museum. Cost: Youth (6 & under) Free; Youth (7-13) about $7; Adult about $14, depending on exchange rate. While we didn’t walk the bridge, we grabbed a cup of coffee from the cafe for an afternoon pick-me-up. After returning the jeep, spend some time checking out downtown Skagway on foot before walking back to the ship. What to do in Ketchikan? For our day in Ketchikan, we booked a private tour with Alaska Hummer Adventures (5191 Borch St.). We chose the Island Hummer Tour ($559 + gratuity), which provided us with a driver and a Deluxe H2 vehicle that seats up to five people for four hours (additional hours can be added for $159/hour). Our driver met us at the ramp of our cruise ship and whisked us off for a fun-filled day. You can fill out a preference sheet for your desired activities in advance, and your driver will be happy to make recommendations, as well. We unfortunately had terrible weather with not only cold temperatures, but driving rain, so we were limited in our options. We braved the rain for a quick visit to Beaver Falls and were fortunate to get a brief respite from the rain for a visit to the Saxman Totem Park. In good weather, make sure to take advantage of the hiking. KidTripster Tip: Ketchikan is one of the rainiest cities in North America, averaging 141 inches each year, so bring all of the appropriate rain gear. We found rain jackets to be much more convenient than umbrellas and wouldn’t even bring umbrellas next time. If you forget rain jackets, they can be purchased at the shops right across from the cruise ship at reasonable prices. The highlight of our day was shopping on Creek Street, a quaint, historic boardwalk with a collection of brightly colored shops on wooden pilings built over the rushing waters of Ketchikan Creek. A former red light district, it’s now home to some of the best shopping in the city. The shops aren’t just your basic souvenir shops but include local artwork, local foods, and unique, hand-crafted items. This is where you’ll find Married Man’s Trail (supposedly the path that married men used to secretly escape the red light district a century ago), a wooden boardwalk along the creek and through the woods which is worth exploring; if you go all the way to the top, you’ll end up at the Cape Fox Lodge (800 Venetia Ave.). Stop in for hot chocolate and great views of the city and cruise ships. Along the trail, look for the salmon ladder, a man-made structure built to help the salmon as they swim upstream to spawn, typically in June and July. Other options for the tour include hiking, the Southeast Alaska Discovery Center (50 Main St.), and the Tongass Historical Museum (629 Dock St.). Your driver will provide you with water and snacks during your tour and deliver you right back to the cruise ship at the end of the tour. KidTripster Tip: If you need a carseat or booster seat, make sure to request it in advance. There’s no discount for booking two cruises in a row, but we did get 10% off each cruise plus an onboard credit because we booked them while on board a previous cruise. Prices vary greatly based on room category, number of guests, ages of guests, how many cabins you get, as well as which sailing you choose. KidTripster Tip: The first and last two Alaskan sailings can be drastically cheaper as most kids are still in school. For tips on saving on a Disney cruise, click here. If we had to choose just one of these two cruises, we would choose Alaska, but I don’t regret doing the first cruise. I loved our days in San Fransisco and Victoria, and more nights on the ship is always a plus in our book. For the Pacific Coast cruise, we flew into San Diego International Airport on the day before the cruise and then took a 5-minute taxi ride to the Embassy Suites San Diego Bay Downtown (601 Pacific Hwy.). We chose the Embassy Suites because we are a family of five, and all of the rooms are suites that sleep five people (two doubles and one queen sofa bed). The rate is reasonable and includes a complimentary breakfast with made-to-order omelets. The morning of the cruise, we took another 5-minute taxi ride to the cruise terminal. KidTripster Tip: Request a room with a bay view in order to see the Disney Wonder sail into the harbor early in the morning. If you’re only sailing on the Alaska portion of the cruise, you’ll need to fly in and out of Vancouver International Airport, which is about a 30-minute drive from Canada Place (999 Canada Place), where the cruise terminal is located. There are several hotels within walking distance of Canada Place, but you’ll pay a premium to be so close. Consider staying farther away and taking a taxi to the cruise terminal to save money; know that Uber is not allowed to operate in Vancouver. If you really want to splurge on luxury and convenience, stay at the Pan Pacific Hotel (999 Canada Place), located inside the Canada Place complex. The morning of the cruise, you just need to take an elevator downstairs to the cruise terminal. They’ll even take your luggage directly from your room to the ship. The cheapest way to get to and from the airport and downtown Vancouver is the SkyTrain, the city’s elevated transit system. The other option would be a taxi. On the day that we disembarked in Vancouver, our flight wasn’t scheduled until 6:00 p.m., so we spent the day exploring Vancouver. We booked a tour through the cruise line, but there are private options available, as well. These tours will pick you up at Canada Place, take you around the city, and then drop you off at the airport. Our tour included stops at Stanley Park (free) and the cost of admission to Capilano Suspension Bridge as well as a bus tour of the city. It was a great alternative to sitting at the airport all day. Cost of the tour: Youth (2 and under) Free; Youth (3-9) $59; Adult $99. This tour was the only one that I booked though Disney, mostly because we decided to do it after we boarded. KidTripster Tip: If you have some extra time at Canada Place, I recommend visiting FlyOver Canada. It’s just like the Soarin’ ride at Epcot but with the dramatic and stunning scenery of Canada. The ride lasts 16 minutes, and you must be 40 inches tall to ride. Cost: Youth (12 and under) about $14; Adult about $22, depending on exchange rate. Save $5 per ticket if you buy online in advance. Diana Smith is an expert cruiser. She and her family, including her three Disney princesses, have set sail on ten Disney cruises. For more, check out Disney Cruise Mom Blog. This writer received some complimentary excursions for the purpose of this review. However, all opinions expressed are solely her own.